Those of you fortunate enough to be Starz subscribers have a lot to look forward to next month—the pay-cable channel is adding a handful of exceptional movies to its streaming library, in addition to debuting two new original TV shows. We’re downright jazzed about Starz’s May lineup, so follow along and you’ll find out why. 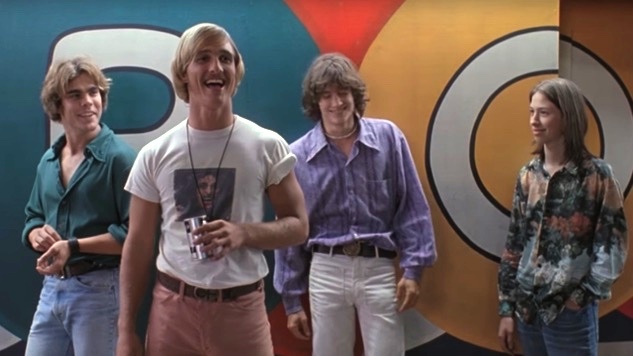 As aforementioned, the Starz movie lineup is gaining a number of stone-cold classics next month, including one in particular that is more “stone” than “cold.” We’re referring to Richard Linklater’s beloved 1993 comedy Dazed and Confused, which follows a group of suburban Texas high school students, both outgoing and incoming, as they smoke, drink and otherwise party their way through the last day of school, circa 1976. The iconic, oft-quoted comedy most memorably featured a decidedly pre-McConaissance Matthew McConaughey as Wooderson, the perpetually stoned, party animal post-grad pictured above, who charmed (and, if we’re honest, kind of creeped out) audiences everywhere with just two words: “All right, all right, all right.” Dazed and Confused debuts on Starz on May 1, as does Oscar-nominated mockumentary Borat (starring Sacha Baron Cohen as the film’s eponymous Kazakh TV personality), Oliver Stone’s iconic, Oscar-winning Vietnam war drama Platoon, Ridley Scott’s feminist road film Thelma & Louise and Johnny Depp-starring romantic dramedy Benny & Joon, among others. Later in the month, Starz adds fact-based rom-com I Love You Phillip Morris (May 4), George Clooney-starring satirical war dramedy The Men Who Stare At Goats (May 4), Noah Baumbach’s darkly funny Greenberg, starring Ben Stiller and Greta Gerwig (May 11), 2017’s ill-received Flatliners remake, Walter Hill’s stylish cult classic The Warriors (May 23), madcap 2001 comedy Rat Race and perhaps most exciting of all, Martin Scorsese’s masterwork of a boxing biopic, Raging Bull, starring Robert De Niro as Jake “The Bronx Bull” LaMotta (May 31). Where the small screen is concerned, Starz’s slate is primarily made up of the aforementioned original shows, both of which are making their series debuts next month. First up on Sunday, May 6, is Sweetbitter, in which 22-year-old Tess (Ella Purnell, Miss Peregrine’s Home for Peculiar Children) moves to New York City to start a new life. She lands a job at the city’s best restaurant, thinking that she’s found a steady paycheck, when she’s actually found her people, not to mention a life-defining chance for self-discovery. The half-hour drama series, based on Stephanie Danler’s bestseller of the same name, also stars Caitlin FitzGerld (UnReal), Tom Sturridge (The Hollow Crown), Paul Sparks (House of Cards), Evan Jonigkeit (Frontier), Eden Epstein (Blind), Jasmine Mathews (Heathers) and Daniyar (Claws)—you can watch a trailer for the series here. Airing immediately after Sweetbitter is Vida, a half-hour series centered on two estranged, Mexican-American sisters, Emma and Lyn, who hail from the Eastside of Los Angeles. When circumstances force them to return to their old neighborhood, they must confront their shared past, including the surprising truth of their mother’s identity. The show stars Melissa Barrera (Club de Cuervos) and Mishel Prada (Fear the Walking Dead: Passage) as the sisters, along with Ser Anzoategui (East Los High), Chelsea Rendon (The Fosters), Carlos Miranda (Chicago P.D.) and Maria Elena Laas (American Weapon). Both Sweetbitter and Vida will air new episodes on Sunday nights at at 8 p.m. ET and 8:30 p.m. ET, respectively. And Starz has also acquired a slew of comedy specials and series that used to call comedy-focused streaming service Seeso home, including Take My Wife, Night Train With Wyatt Cenac and The UCB Show. The last base we’ll cover is everything leaving the Starz app in May, a slate of losses that starts off bearable, only to turn excruciating as the month goes on. 1963’s Oscar-nominated, Peter Sellers-starring The Pink Panther hits the bricks on May 2, followed by Jodie Foster-directed crime thriller Money Monster on May 21, beloved law school comedy Legally Blonde on May 24 and iconic Bruce Lee martial-arts adventure Fist of Fury (aka The Chinese Connection) on May 30. Most of May’s outgoing titles at least have the decency to stick around till the end of the month before punching us in the gut with their absence: Jim Carrey vehicle The Cable Guy, space-set horror-thriller Event Horizon, Bill Murray-starring comedy classic Groundhog Day, shockingly prescient Mike Judge satire Idiocracy, Oscar-winning Nic Cage starrer Leaving Las Vegas, beloved baseball classic The Natural, Sydney Pollack’s Oscar-winning Tootsie and James Mangold’s acclaimed Johnny Cash biopic Walk The Line all vanish from Starz on May 31. See Starz’s full slate of incoming and outgoing programming for the upcoming month below.